Steel Ring Academy Is a local HEMA group out of Bradenton Florida. It was started by a group of people who loved swordplay, and when HEMA started becoming defined in the world community as an organized art it was a perfect fit. It started as a simple gathering of folks with a similar passion, and evolved into a serious study group, and we hope, finally into a full fledged Martial Arts school. We are dedicated to the study and interpretation of manuscripts that exist from the war schools of Medieval Europe and before. From these masterworks, or Fechtbuchs, we pass the knowledge and techniques on to our students. We are affiliated with the Historical Fencing Association, a nation wide group of groups full of people dedicated to the same. Check us out, and come join us in the Ring! Our Club is a group of Sword Fighters who meet on a weekly basis, train and study and enjoy each other's company. We are affiliated with other clubs across the United States and share common study habits and comparable styles/recognition. In this way we are able to fairly compete with each other and communicate our skills and even hone our teaching methods. Specifically, HEMA is the study and practice of individual weapons combat as it was taught and practiced in the Medieval and Renaissance periods all over Europe. New manuscripts and treatises are being found every year. These are studied and the instructions then applied to the use with modern equipment and safety considerations. HEMA sporting events are held worldwide and sword fencing is fast becoming a largely recognized sport. There are many groups that practice HEMA all over the World. 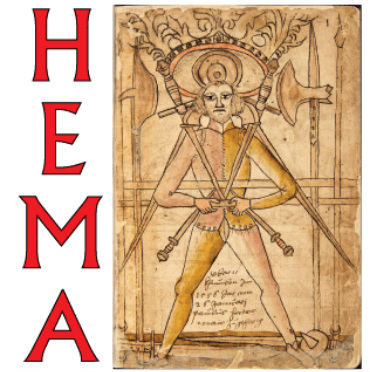 HEMA's diversity and scope of Period is broad and covers weapon and fighting styles from hand to hand grappling, to sword play, to polearms and great shields. HEMA attracts a broad spectrum of people for many reasons. For the Competitor, the aspect of individual competition is a great draw. For the Historian, the Fechtbucher - or fight-books, were written and methods all developed throughout History. For the Intellectual, HEMA has the challenges of trans-national, trans-lingual, and even trans-temporal study, of the Fechtbucher. For the Geek, well.. It's Sword Fighting - If you gotta ask, you don't get it. For the Martial-Artist, the discipline and exercise it takes to excel in HEMA takes dedication and heart. Here at Steel Ring Academy we explore and allow our members to explore and study any and all the aspects of HEMA as they wish. We give a framework and guidelines in which a person can grow. Steel Ring academy recognizes several "tracks" in HEMA practice. We see these tracks as equally important to the growth of HEMA as a hobby and interest in the community. These tracks are often identified as: a Sport Track - The appeal to competitive sword play in arenas of tournaments and conquest. A Traditional Track - the appeal to the connection to History and actual people who lived in other times and learned the same techniques and and methods to learn to use swords. And the Enthusiast Track - the appeal to spend time and energy learning things that bring people together in camaraderie. Using the traditional Language most of our schools manuscripts are created in we call those tracks, the Feder-Fechter as the sport track, the Ernst-Fechter as the traditional track, and the Schimpf-Fechter as the enthusiast track. To perpetuate and encourage all three tracks, we deliberately plan classes and activities that will benefit each of the three tracks in equal measure. We ensure fun, fit, and edifying experiences in this way and keep things fresh.